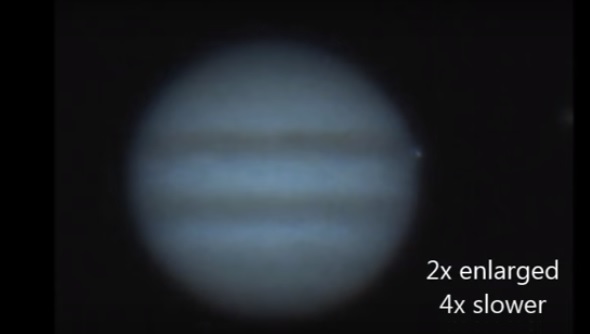 An amateur astronomer has just taken a remarkable video of something colliding with Jupiter. An amateur astronomer in Austria has just captured something truly remarkable: something smashing into its surface, creating a giant plume. It may have been an asteroid, it may have been a comet, but something definitely collided with the giant planet at an incredible speed, and it was captured on video, which you can see below, according to a Popular Mechanics report. The astronomer’s name is Gerrit Kernbauer, the object he videotaped was relatively small but reached an incredibly high velocity because of Jupiter’s tremendous gravity, causing a plume of debris after flying into the clouds with the force of 12,500,000 tons of TNT. It was very lucky that Kernbauer was able to get this video. Collisions like thisonly happen once a year on average, with the most graphic one being in 1994 when the Shoemaker-Levy 9 comet smashed into Jupiter and was captured by NASA’s Galileo probe, which was near orbit of the planet. Comet Shoemaker-Levy 9 broke apart in July 1992 and collided with Jupiter two years later. It was the first direct observation of an extraterrestrial collision of two Solar System objects, and it was widely covered in the media at the time, before the age of the Internet. It was more than just a curiosity: the impact taught us a lot about Jupiter itself, and showed that the planet helps reduce space debris in the inner solar system, protecting us here on Earth from deadly comets and asteroids.